Gail Postal contemporary icons in oil combine realistic graphite portraits and imagined fabrics with a touch of bling. Gail paints ordinary people as icons, revealing the dignity and beauty of the everyday. “life is pretty hard sometimes” says Postal but I try to convey a kind of beauty. Not standard academic beauty, but a combination of inner beauty and an ideal of who the person really is. 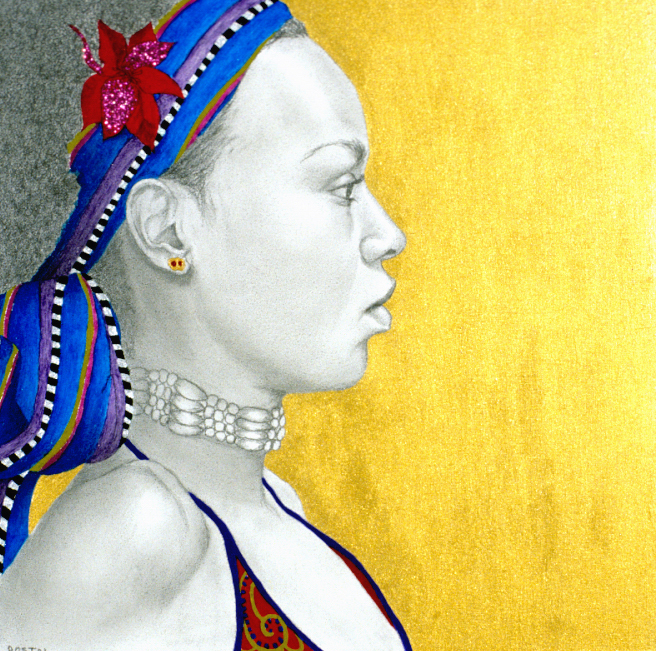 Postal’s images marry the intense detail of a graphite pencil drawing from life with vivid colors and patterns against a golden background, embellished with glitter and sparkly crystals. It took a world of art to create the mature style that a Postal painting embodies. From Russian icons she borrowed her golden backgrounds. From Persian miniatures she took colorful, flattened patterns. Japanese hand-tinted photographs that she found in a Parisian flea-market inspired her with their washes of watercolor over areas of the black and white photos. From Fra Angelico, Postal took finely observed details rendered in crisp edges. Postal spends so much time on each piece that the intensity of her focus tends to make the subjects larger than life to her.It’s as if Postal is looking into the subject’s soul.